Netizens are on outrage after a photo of a young man had circulated over the social media showing a dog he had run over without remorse. 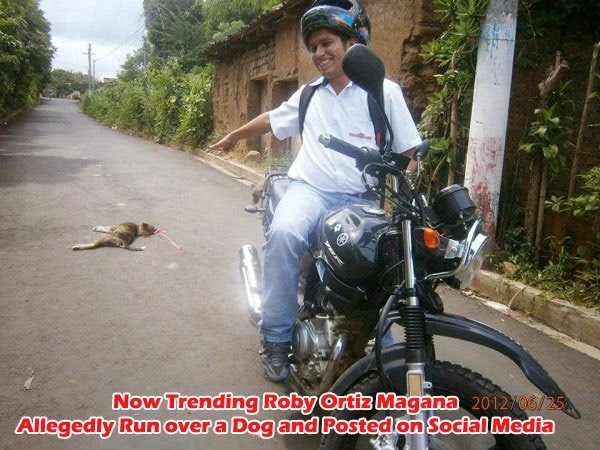 Roby Ortiz Magana had dominated the social media as he is now under the hunt of those demanding for the poor dog’s justice. Roby Ortiz Magana was reportedly living in Ahuachapan City of El savador. His photo had caught the attention of many netizens as it had shown him full of smiles pointing at a seemingly lifeless dog after he had allegedly run over the poor animal. The photo had been posted in his very own Facebook account. An animal right group is now vouching that the young man is still in El Salvador and not in Rome, Italy as had been noted in his personal account. Many had suggested that he must be arrested for such animal cruelty. Apparently, Magana had allegedly changed his Facebook account into Alessandro Anchelote as the famous social media conveniently gives the freedom to its user to alter the names of the account users and their locations. While it is unclear as to how the animal rights group could say that he is still in El Salvador, the group is currently on the move to identify and find him. PetitionHub had been used to find the young man and made him answer for the consequences of his action. Some netizens vowed to look for him, especially those around the area. Many expressed their shock as to how he was able to post a photo of such cruelty and how Facebook was unable to monitor it. The social media, Facebook, has an option wherein people can report such cruel photos, however, it needs the cooperation of other users to spot such photos within its realm.